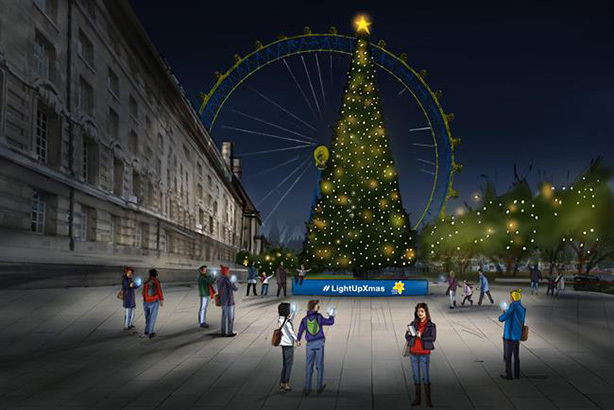 Marie Curie, the terminal illness charity, is creating a memory-powered Christmas tree. The fairy lights on the tree will be powered by people sharing their memories on Twitter and Instagram using the hashtag #LightUpXmas. The lights will shine brighter as the number of posts grow. The tree will be located in front of the London Eye on the Southbank between 4 and 17 December. Dr Jane Collins, chief executive of Marie Curie, said: "Christmas is about creating positive memories and being together at a special time. "For many people living with a terminal illness, this will be their last Christmas but Marie Curie Nurses, volunteers and campaigners will be helping ensure they are able to make the most of the time they have, with the people they love."